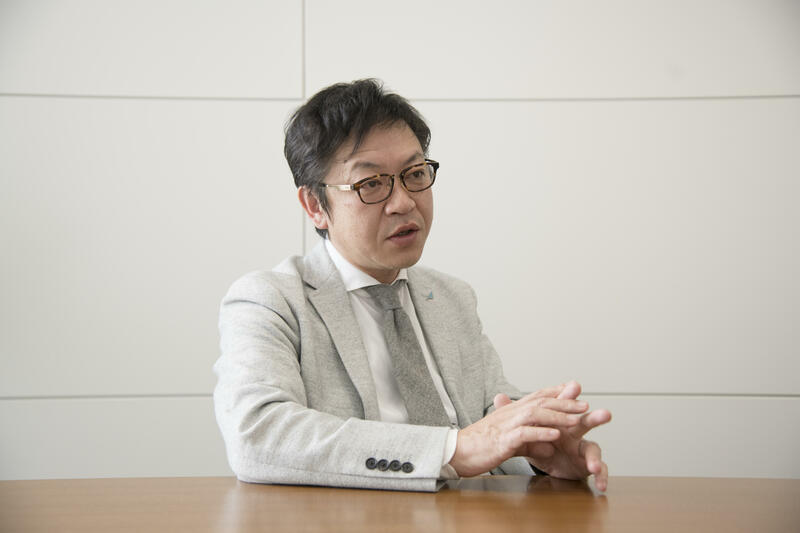 Masataka Kaji, President of the Kaji Group, a group of companies based in Ishikawa Prefecture and part of the Hokuriku Producing District, which provides an integrated production system covering from textile machinery manufacturing to yarn processing, to textile and knitted fabric production, to sewing, shares his thoughts about the textile industry and the production center. The establishment of an integrated production process from yarn making to products In 1934, the Kaji Group began as Kaji Seisakusho Co., Ltd., a textile machinery manufacturer based in Kahoku, Ishikawa Prefecture in the Hokuriku region. The company then founded Kajirene Inc., a textile producing company, Kaji Nylon Inc., a yarn processing company, Kaji Knit Inc., a knitting company, and Kaji Sewing Inc., a sewing company. Together, they form an integrated production system from yarn processing to products. The Group has a machinery design division, which is not often seen in this industry and constitutes one of our strongest competitive edges. For example, if we have some yarn that we want to make in the yarn processing phase, our machinery development team members can draw a rough sketch of it and even build a machine to make the yarn within the company. We can also differentiate ourselves by remodeling a loom or attaching different components to a yarn processing machine that we purchase somewhere else to produce many types of yarn. Kajirene, which produces synthetic textile fabrics, is at the forefront of manufacturing light textiles made with such processed yarn. We are proud of our world-class technology in the high-density weaving of filament yarn that is much thinner than hair. Kaji Knit also specializes in thin knitted cloth. Fine yarn is very delicate and difficult to handle, but we specialize in light textiles and thin knitted cloth - something that is more difficult to manufacture - to differentiate ourselves. The technology of the Bemberg composite yarn developed with Asahi Kasei A yarn processing company, Kaji Nylon is preeminent in manufacturing Bemberg-centered polyester and nylon composite yarn, which is our proud technology that we have developed together with Asahi Kasei for over 15 years. Back in those days, no other companies were yet engaged in Bemberg composite processing, and so we started with mechanical design. In composite processing, fibers of more than one kind are bonded together to combine the strengths of each fiber. For example, although Bemberg has no elasticity, by using polyester or nylon as the center of yarn and Bemberg around it, the yarn can be elasticized while maintaining the texture and touch of Bemberg. We change the formula according to the use and purpose. Because of the subtlety in the formula, however, it is very difficult to maintain the same quality over tens of thousands of meters in length, requiring advanced technology and skills. 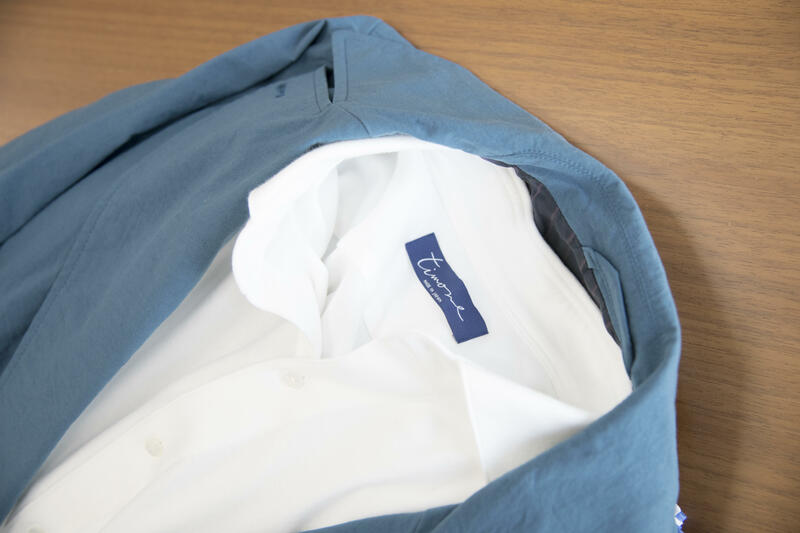 House brands launched to increase recognition of the Hokuriku Producing District In 2014, we launched a house brand specializing in travel clothing called To & Fro, which means "going back and forth." In 2015, we launched the men's fashion brand Timone, which means "rudder" in Italian. We launched these brands because not many people were aware that Hokuriku is a textile production center. 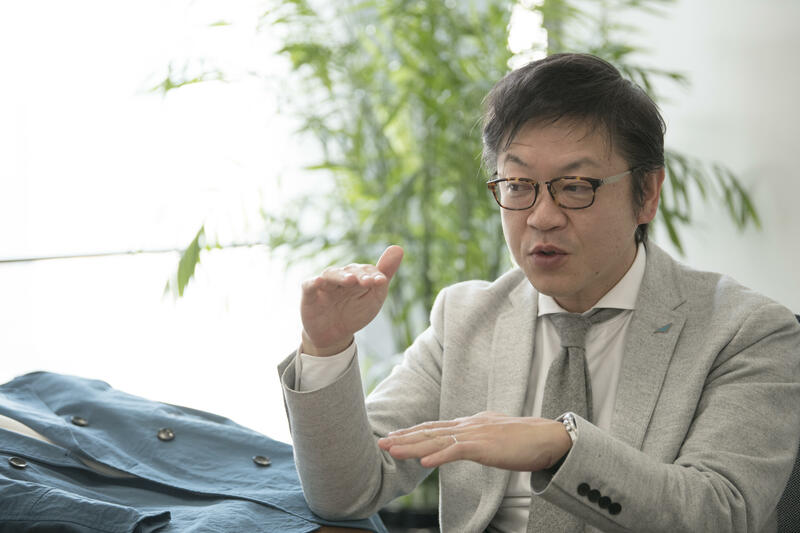 Hokuriku is, in fact, a large production center of synthetic fabric, producing 85 percent of the synthetic fabric in Japan, which have been introduced by many famous luxury brands around the world. Despite this fact, there was little information about this transmitted to the public, and few branding efforts had been made. Out of concern, we were determined to disseminate the message. A travel brand was the best for us to take advantage of the functions that we have cultivated, such as light weight, compact, strong, and water-repellent properties. When Timone was launched, the brand was widely reported in the media, and it received a new face award from menswear buyers from department stores. Through the products of these two brands, we have continued to disseminate the message that Ishikawa Prefecture, as well as the Hokuriku region, are outstanding production centers. Having launched the end product has also produced a good effect within the company. Through the experience of having customers buy products made by us and receiving their thanks, we have changed our way of thinking; we now think about how to make use of customers' opinions, which has also led to an improvement in the morale of employees. Initiative to transmit the appeal of the textile industry for the future I always have a sense of crisis toward the future of production areas. We often hear that today's smaller businesses have a hard time hiring people, which is now a major problem across Japan. 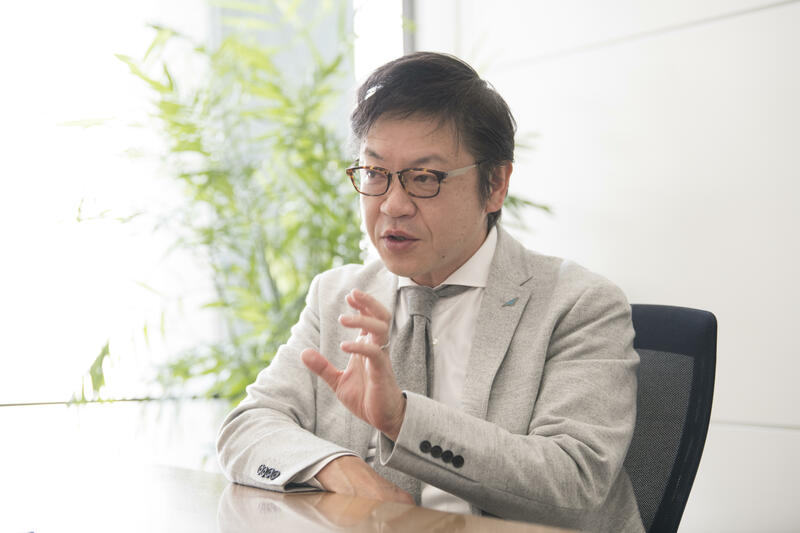 The textile industry in Hokuriku is also experiencing a harsh environment because it cannot help but be associated with the image of a declining industry. Again, I believe that it is important to disseminate and communicate. The Kaji Group often disseminates information about its house brands and other new businesses, so that young people will see us as a company where employees enjoy working and dreams thrive. Thanks to these efforts, we received 300 applicants for three positions that were open for new graduates. I am also proud of our high retention rate. With the motto "We are one big family," we focus on creating an environment that shortens the distance between employees as much as possible. We regularly organize events to facilitate communication with each other, which are not only serious training camps or training exercises, but we also go to a hot spring resort with a total of 250 employees from the Group companies in Japan. That is why our employees come and talk to me about their romantic relationships or even their family problems like a real family. Of course, we take the business aspects seriously, but we value such awareness in general. Our corporate message "Realize the dream of the textile industry" is infused with the determination that "the textile industry is really interesting, so let us take initiatives to embody it!" I always send this message to our employees, and it is also written on large boards and posted everywhere in the company. In the future, if we can develop applications or collaborate with a range of genres, the possibilities should expand. I believe that there are still many dreams to fulfill in the textile industry. I want our members to have this awareness as well. President, the Kazi Group The Kazi Group consists of seven companies, both domestic and overseas, which together provide an integrated production system, covering everything from textile machinery manufacturing to yarn processing, to textile and knitted fabric production, to sewing. In the textiles business, the Group holds Kaji Nylon Inc., a yarn processing company, Kajirene Inc. and Kaji Knit Inc., both textile producing companies, and Kaji Sewing Inc., a sewing company. Together, they form a value-added integrated production system by utilizing the expertise on textile machinery cultivated in the machinery business. → Travel brand "To & Fro"
→ Men's fashion brand "Timone"